Bento requires Mac OS X v10.5.7 Leopard or Mac OS X v10.6 Snow Leopard and will not work with earlier versions of the Mac OS. Filemaker has released version 4 of its popular and very capable consumer database program called Bento. Bento 4 offers all the abilities of the earlier versions and includes a list of enhancements that approaches my wish-list for this program. Bento is a powerful database program that makes it easy for the home user to create and maintain databases for any purpose they can imagine. Programmers at Filemaker have obviously applied their years of experience with creating their professional level database program to develop a truly powerful program for the home and small office use. The interface is easy to learn. Most users will be able to apply an existing template, or even create their own layouts with ease. This powerful database program integrates nicely with Apple’s iPhoto and Address book, and iCal programs. Allowing the user to take advantage of features these applications don’t offer but Bento does. For instance creating a “smart list” that instantly creates a subset of the data that meets specific criteria. A popular smart list in my house is one that extracts those close friends we normally exchange gifts and cards with, from a huge list of friends, business associates, and other contacts that reside in our home address book. I and others have written many reviews of Bento since the release of version 1. If you are unfamiliar with this application and all its abilities I recommend that you search for one of these reviews. This review will primarily consider the improvements and new features of this program. First of all, Bento 4 seems to perform very well. I have run into no issues, including upgrading my old database. The people at Filemaker say that this new version is faster. Not much has changed in the interface, except for a few new commands, so if you already use Bento there is only a short time to learn how to use this new version. It is important that the user upgrading to Bento 4 learn about the new features, since they are mostly well integrated into the program and you will only see them if you look for them. For instance, one feature I have begged and pleaded for is for Bento to print labels. Now it does! Previously, Bento shifted the label printing functions to those native to Apple’s address book. This was okay for some purposes, but posed some challenges. For instance, Apple’s address book doesn’t recognize any smart list you create with Bento, so there was no way to print labels from a smart list, (although there was a work around). The design of this new feature is well thought out. The default is a basic address label. 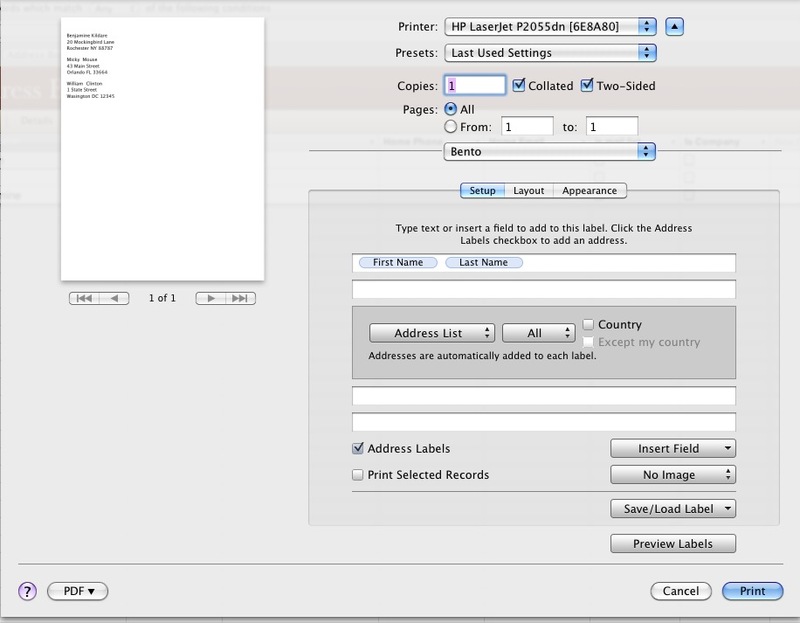 When you select print, there is a button on the print dialog that says, “print labels”. Click on this and a new print dialog opens. The default layout makes a fine label. However, you can choose to include other fields from your database as well. There is an option to attach an image on the label. The program shrinks the image down nicely to fit into the small label size. Bento includes templates for Avery and Dymo labels by their number. If you need a specific label layout, you can easily create your own layout by adding fields and stacking them as you like. Which means you can use the Bento database to create labels or tags for just about any purpose you can imagine. These printing routines give you a lot of control on how the label is organized. There is a print preview, so you can see how the labels will look. There is also the ability to start printing on some label other than number one. This is great if you have a partially used sheet of labels and want to finish it up. Another useful feature is the ability to share the data in a database along with the template. You could share the database template, but not the data in previous versions of Bento. Now you can share the data as well. I can see this is very useful in a lot of situations. For instance, in an office where one person is tasked with maintaining a database which is to be used by others. In previous versions, you could share and even update a database from another computer that has sharing turned on, but this database would not be available when you are not connected to the local network. You could also export the database and import it on the other computer, but important items like the layout of data fields, images and other media would not be transferred. So a small business could not easily share a catalog of their products, with animations, and images with their own sale people or even customers. With Bento 4, when you choose the export function, there is an option to include data along with the template. The data includes all the media as well as the text. I think this is a terrific new feature. Years ago there were programs on the Mac that gave anyone the ability to share organized data about something of interest to them to others who owned the application (Hyperstudio and Apple’s Hypercard for instance). Using the sharing feature of Bento 4, I could create a database of information and share it with students in a class or just friends who own Bento. This feature has a lot of potential! Of course, this leads me to suggest one more step in the sharing process, wouldn’t it be nice to be able to share a copy of the catalog, information, or whatever with people who don’t own Bento as well? Some form of a licensed runtime only version of Bento. Just food for thought! In any case, the export feature is easy to use and works as expected. Just one work of caution, since the export data is part of the export template dialog, be careful to turn it off if you intend to just share the template! Otherwise potentially personal information might go along with your template. Speaking of sharing templates, Bento 4 makes it even easier to share with the template exchange. In the template export dialog you just need to click on share with template exchange and the template is sent. I assume you can share the data with the template exchange as well. It will be interesting to see what type of new templates along with data make their way to this exchange in future. For people who want to include even more data in their databases, Bento 4 includes two new interesting features: Voice memos and automatic location. Automatic location uses the location services of your portable device to find and record your current location. Using an iPhone or iPad with cellular services, you could capture an image, or write some information, then have the location services record the exact GPS location of where this occurred. The location feature is also tied to Google Maps, so you can click on the coordinates and see a map of the location. Using the voice memo feature, you can create a field in the database to record audio into. There are several practical uses of this feature, one that comes to mind is the classroom. A database could be created which includes space to take notes during the lecture as well as recording the lecture. After, when reviewing the notes, the lecture could be reviewed as well, and those points that weren’t clear or even missed will become available. I could also see it being used to provide information about an object in a database that might not be apparent by looking at the object. Another very useful new feature is the ability to lock a form’s layout. I don’t know about you, but I have a habit of accidentally grabbing a field when I click around a database. So instead of doing what I intended, I move or re-size the field I clicked in. In Bento 4, you can choose to lock the form. This turns off the ability to rearrange and re-size fields on a form. If you later decide you would like to work with the fields, click off the lock, and the fields become movable again. A lot of people are not happy that they cannot move iCal tasks onto their portable Apple devices. It doesn’t make sense, moving your task list onto a portable device makes them available for review no matter where you are. With Bento 4 you can now sync the iCal tasks with Bento, then sync them to your portable device. You will see them and be able to edit them on the Mac. This is a feature I think a lot of people will be very happy with. Along with the release of Bento 4 for the Mac, Filemaker will be releasing new versions of Bento for the iPod Touch / iPhone and iPad. These new versions take advantage of the new features in Bento and add several new features to the portable device. I am a big fan of the iPod Touch and tend to use it as a PDA as more then a music player. I have been using Bento on the iPod touch for a number of tasks, but the most important use is for shopping lists. Rather than wasting a scrap of paper, I created a database of products at various stores. Along with this list, I created a smart list that shows only the items that I designated when needed (using a check box). At the store, I load the smart list, and as I put items in the cart, click off the check box, which removes the item from the list. Really cool and efficient! In the previous version of Bento for the iPod Touch, I had to select the item, open the record, to be able to click off the needed check box. In Version 4, you can choose to have a check box field shown on the list view. This means I can click off items directly from the list view, without opening the record. I love it! Bento 4 also makes accessing the smart list view easier. 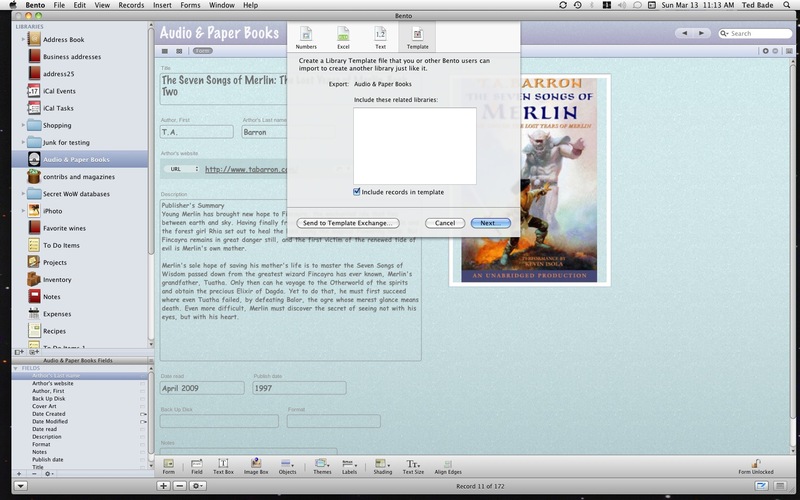 Previously, there were two ways to view one’s list of databases in the iPod version of Bento, list view and cover flow view. While any large database could have a number of sub lists, you could not access a sub list from the list view. To access a sub list, you needed to select the main database in cover flow view, click on a button to flip the cover view around, then select the sub list from those listed there. In the new version of Bento for the iPod Touch, the cover flow view is now used only for selecting templates to create a new database. Your created databases all show in a list view. If there are sub lists, an icon at the end of the database name shows the number of sub lists, touch this icon and you get a menu of sub lists, then select the list of interest. This seems a lot more efficient to me. The new version of Bento for the iPod/iPhone also now allows you to change screen orientation. This is very useful when trying to read a longer entry. It also means that the virtual keyboard has a wider aspect when you need to type, a real benefit on this small screen. Voice memos seem like a great feature for these portable devices. It would be a lot quicker to speak a comment, or thought, onto the device, then later you can transcribe it into text. Or remember a thought you had. While this is not an issue for me, the newer version of Bento for the iPhone/iPod Touch will also be available in other languages including: Japanese, French, German, Italian, Spanish, and Dutch. On the iPad, I expected more. For my longer text field, there is a way to tell the iPad to give it more space, by choosing how many lines of text to show, not intelligently by how much data is in the field. Each database field takes up one entire line, so instead of a neat layout of the author’s first name on the left side of the line followed by the last name to the right, they are forced to be displayed on two separate lines. With the iPad and its larger format, I would expect some semblance of the layout on my Mac display would transfer to the iPad, but this was not the case. I realize that the transferred database can be shifted around to make sense on the smaller device, but why not keep some of the original order? In both cases, the transferred layout still mystifies me. What I get bears little resemblance to how I had the field organized on the Mac. Granted, you need to tell the app which two fields, and which media or check box field to show (if there is more than one), when you view the list of records in the database. But when I enter the view showing the full record, the layout is scrambled. I expected data would be organized a bit more like it is on the Mac. And especially do on the iPad. I see an easy solution for Bento on the Mac. Among all the layouts that one can create, there should be an option for iPad and iPhone/iTouch devices. This way one can take advantage of the Macs interface tools to create logical screens for the portable devices. The default layout of fields should at least, approximate that of the Mac’s layout. This doesn’t mean I don’t like these two portable versions. I do. I regularly use Bento on my iPod Touch as a shopping list, to find contact information, and even to research what is going on with an author’s web site. I would be lost without Bento on the iPod! I have yet to find a real purpose for Bento on the iPad, but that’s just me. I am sure there are thousands of users who have found this App to be very useful. I can see it used in classrooms, as a high end catalog with pictures and even animations, and other uses. Overall, the new version of Bento is terrific. It is a must-have for all current Bento users. If you use the portable devices, the new versions of Bento is also a great idea and I would recommend downloading them. The cost of Bento 4 is the standard $49, and there is a $20 rebate for current Bento owners. A group of five licenses can be purchased for $99. The portable versions are $4.99 each and the update is free to current owners. I highly recommend Bento for anyone who has a need or interest in organizing data. It is the easiest database program I have ever used and by far the most powerful consumer one available. Thanks for this review, but it’s really distracting that you do not understand the difference between “it’s” and “its”. Yes thank for taking the time to write a hands-on, honest review of this product (and others). It was very helpful. However, I have to second the annoyance at the poor grammar (e.g. its vs. it’s, Bear vs bare, early adapter vs early adopter). Thanks tedbade for the review. Haven’t been able to find many bento 4 reviews out there, so this was great. Thanks Jon. Ted will appreciate your comments. I haven’t read any other Bento 4 reviews, but wonder if the others are as long and as in-depth as this review. If you liked this review, check out Ted’s astronomy reviews and articles on the Space page. I am glad you found the review and found it useful. It is my goal as a semi-literate “techie” to try out new software like this and share my knowledge and experience with others. It’s always nice to hear my words were actually useful! If you have the time, please let me know if you do buy it and your thoughts on using it. I am considering purchasing the Bento app for my iPhone, but currently using Bento 3 at home. Do you suggest upgrading to Bento 4 prior to purchasing the app? As you read in my article, Bento 4 has a lot of features that I think are important. The biggest one (for us at least) was the ability to print labels, but there were a lot of other nice additions as well. I would recommend updating to version 4 definitely. I really feel the mobil app works very well with the desktop version. My wife and I both use the mobil app for a lot for different things. Just be aware that most of the new features in the mobil app don’t require you using version 4. But accessing them would require doing your work on the tiny screen rather then the desktop! So the answer is, you do’t need to, but I think it is a very good idea. I was referred to the ‘Bento’ product and reviews after explaining to the folks at local Apple store I needed a simple Project Tracking Software. They said this product would do it. I see lots of discussion about creating databases, but nothing about usefulness as a pre-designed project tracking software. I’ve asked Ted to look into this for you. It should be easy to make distributable versions of what you want with FileMaker Pro Advanced 11. I have little experience using Bento to track a project. A quick search on Bento’s free template site shows a number of templates that might be of use. (http://solutions.filemaker.com/database-templates/search_results.jsp?search=project). The first template that is listed looks like a very promising general project managing one. (http://solutions.filemaker.com/database-templates/detail.jsp?serial=25517117). Check it out to see if it would work for you. I would suggest that you download the free trial of Bento and this template to see if it does what is needed. If it works to satisfaction, a full license can be purchased and the work that was done won’t be lost. Also, you can purchase the iPod/iPad version and take the manager on the road with you! I have found that Bento can be used for a number of things, mostly limited by ones imagination. A good thing about templates are they you can edit them, so if something doesn’t work for you, it can be changed so that it does.